I LOVE “Pigs Aplenty, Pigs Galore”! 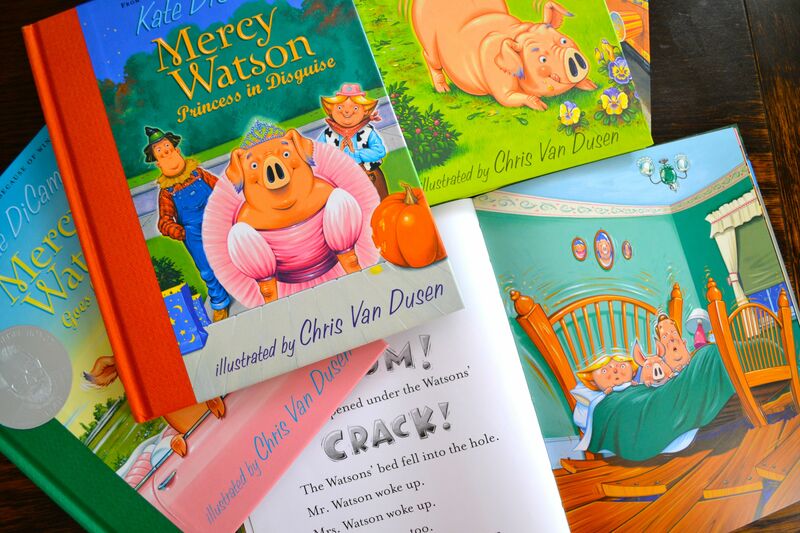 My sister got it for my kids when they were little – the colors are so lovely, and the facial expressions of the pigs (and their oh-so-reluctant host) are priceless. To be honest, I think the reason I was not enamored with it at the time was because my son made us read it to him constantly and then read it yet again and again (it’s not a short book!). Then my husband thought he was so clever to recite it to me when my son wasn’t around. I think I still know the words! The best part of my day is when I can sit down and read to my kids. I love books and I love sharing my passion for books with my kids. It’s a time for discussion and one on one time. I also have a hard time of getting rid of those special books. I have a basket of baby board books that hold so many special memories. Even though I am still very young, I am looking forward to reading those books again to my grandchildren. Like you I can part with the junk and some toys; but the books, well, they hold all the memories of childhood. Love post! My kids still read my childhood books. I couldn’t part with them then and I can’t part with them now. Even the boys tattered Brown Bear, Brown Bear (which they have clearly outgrown and no longer want to hear three times a night) seems difficult to part with. Yes, I have loads of board books I can’t part with. My son had it memorized and used to read it to himself at 2. I can still hear him reading it in that sweet little voice! Couldn’t part with that. Every book tells a story. love it and get it completely. i give so much away to my nieces and nephews but certain books will stay no matter how beyond them they are. because as you said, I am still that mom who wistfully remembers that place by the bed, with those special books in hand. This post really resonated with me! My son is starting to outgrow some of those younger chapter / early reading stories and it’s bittersweet. It’s sad when they move on and think they’re too big for something. But there are many great things ahead! Lovely post – The ones I can’t possibly part with are the favourites from the baby days. Either the ones I read to them or my husband as I lay beside them… Time for Bed, Daddy’s Kisses… sigh. I am the same with my daughter’s books. Certain ones bring me back to certain moments during her life. I have more trouble getting rid of books than toys or clothes. Thanks for the story. Yeah, I haven’t had much trouble getting rid of toys! This made me want to cry! Books are so dear to my family. I read to every one of my four siblings and to my parents as well. Many vacations, school nights, summer days were spent with a book in hand laying about in bed painting stories aloud. Now I’m reading to my babies and find it so bitter sweet that those days are ahead of me but for a short time. ❤ Thank you for sharing this sweet story. Ah, so bittersweet. I just boxed up all the board books, those baby books for counting, but also The Big Red Barn, The Going to Bed Book, Are You My Mother, Guess How Much I Love You. I needed to make room for the chapter books and other big kid books, most especially the Captain Underpants series, The Littles, and James and the Giant Peach. The boys watched me with little interest whereas they usually fight to keep each and every one of their books. I am telling myself that I am holding on to that box of books in case I end up teaching Kindergarten or even Preschool somewhere along the way, but really, I am keeping it because it is a box of memories I am not quite ready to let go of. The books and reading time – I get the connection. My wife also has a hard time getting rid of the boy’s books. There are a few in particular she seems connected to. If it were just a few, I’d be happy. I already have a full bin out in the garage. But my husband can’t say anything because I’ve seen him sneak some in there too. That’s cool. I suppose when you are a grandparent one day, you will have plenty of ways to entertain them. Mine were never impressed with my impressions either, or so I thought. The other day my 11-year-old said I did a great Professor Trelawney impression from Harry Potter. (I haven’t read it to him in a couple of years now.) Every now and then a character deserves a different voice. Hang in there with your two-year-old. It will get better. Or worse. Mine repeatedly asked us to read the same book over and over and over. Torture. Senior year? Wow. Mine is starting fifth grade next week and I wonder where the time went. I’ve noticed my son tends to hang onto his books longer than my daughter does. Tattered Harry Potter copies may just be there when he goes to college too. Me too, Elyse. Gwen left last week for her senior year. The years just fly by, so hold them tight while you can. My kids aren’t as old as yours but I can already relate to how you feel. I’ve been feeling nostalgic about growth in general, and since I don’t plan to have any more kids, I know that this truly is it: there won’t be any more baby moments, and my preschooler is turning into a big kid… it’s exciting but saddening at the same time. Those realizations are sad when they are little. Right now it’s not as hard as leaving that preschool phase, I think because they’re in the elementary school years for so long and you feel a little safe for a while. But middle school is looming. That’s another growth that seems bittersweet. this just made me cry as i’m sitting in my parents driveway with two sleeping babies. I’m dropping them off because my 2.5 yr old was driving me up the wall….I even cried cuz I was so MAD! I know he’s just so little still and still trying to understand how the world works. thank you for reminding me at justt the right time to cherish my little boy. Don’t feel bad. 2.5-year-olds can make you plenty mad. So can 10-year-olds and 8-year-olds. It’s hard! Just get through it and move on. There are plenty of awesome moments too, right? Like when they sleep. 😉 Angels. Oh, so painfully true! I have a hard time moving on from some books.. But thanks for these recommendations..my five year old daughter and I will try them! She doesn’t dress up on a daily basis anymore and that is hard to let go too. We read to our kids every night since they born and I am convinced that is why they are both very good students. My youngest just did a super-cleanup of her room (practically at the point of a gun, though) and I noticed not a single book in the Goodwill pile. She spent her spare time this summer rereading her favorite Brian Jacque/Redwall books from junior high. I agree, Peg. I’m also convinced about that reading to your kids thing. I swear by it and I’ll do it as long as they let me. If it weren’t for that, I am convinced my son wouldn’t like to read as much as he does. We pushed through the hump until we found books he liked. Leave them hanging every night, and they’ll pick up those books on their own to see what happens next. Do you still read together? I have a friend that sits with his family and they plough through great works like The Lord of the Rings by J R Tolken. I hope I can do this with my son who is 4 and will soon start to read. We read every night (picture books with simple stories). This is really the only time my son will actually allow me to read to him. I make the most of it and read a few. I’m hoping we’ll share some of my favourites soon. The BFG by Roald Dahl is one I’m looking forward to the most! Oh, my son loves Roald Dahl! He went through a phase where he read all of his books over and over. I do miss the picture book phase though. My kids are starting to clean theirs out and they just bring back so many memories. Just cherish that bedtime! I will, I’m trying to start bedtime earlier so we can spend more time reading. cronicle of events pierced my heart, that while I “taught” them the value of reading I missed the value of reading with them. I don’t know how old your children are, but maybe it’s not too late? I remember reading a blog post quite some time ago about a family with children who were college aged. When they came home, the parents (who were maybe professors and had professor friends, can’t remember) and their friends and their now grown children would sit around the dinner table after dinner and read, often staying up late to finish a book. Chronicles of Narnia was a favorite. I thought that was so unique. Most people’s dinner parties are spent talking, maybe the kids run off to watch a movie (or at that age leave?). And I know of some people (couples) who read to each other on long trips. It’s a thought? I’ve always wanted to try that. that’s inspiring! I’ve 3 all in college – I’ll find my way, thanks!